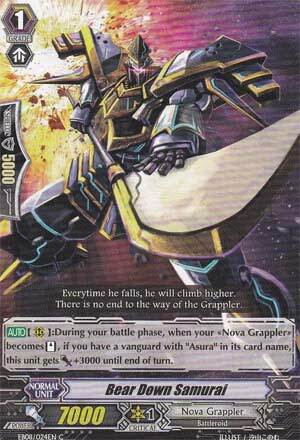 [AUTO](RC):During your battle phase, when your «Nova Grappler» becomes [Stand], if you have a vanguard with "Asura" in its card name, this unit gets [Power]+3000 until end of turn. ...honestly, all I can say about this card has already been said when we reviewed Daredevil Samurai, and not much has changed about my opinion about either of these cards, so take a look at my review on Daredevil Samurai except change it to this card...that and seeing this card boost for 25,000 by itself is both hilarious and scary. See my review regarding Daredevil Samurai. Do not however that being a booster, you do need to have some way of standing the guy in front of him to be useful. But as long as you remember the Mond/Immortal Asura deck I described, you’ll be okay.